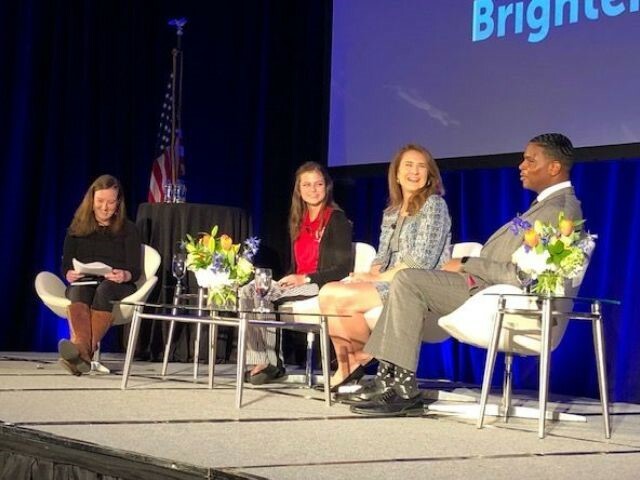 Electric cooperatives have much to offer younger generations, but the challenge can be spreading awareness of them – this was a key point of the Young Leaders Panel at this week’s Statewide Annual Meeting in Raleigh. The panel, moderated by Lisa Crawley, communications specialist for North Carolina’s Electric Cooperatives, included Caitlin Finley, the Youth Leadership Council scholarship recipient and Youth Tour participant from Blue Ridge Energy; Victoria Baskett, a 2016 recipient Miss NC STEM Scholarship sponsored by North Carolina’s Electric Cooperatives; and Qua’Zavion Johnson, who was sponsored by Halifax EMC to attend the North Carolina Cooperative Council’s 2018 Cooperative Leadership Camp in White Lake. Baskett agreed, stressing that when organizations like electric co-ops support young people, it better prepares them to work with older generations once they enter the workforce. “It prepares them for more in-depth conversations, better workplace processes and just a better understanding of how to meet people where they are,” she said. Johnson joked that his experience at the leadership camp gave him a taste of the challenges that can arise in bringing people together to work toward a common goal. The group was tasked with designing and marketing T-shirts using the cooperative business model.